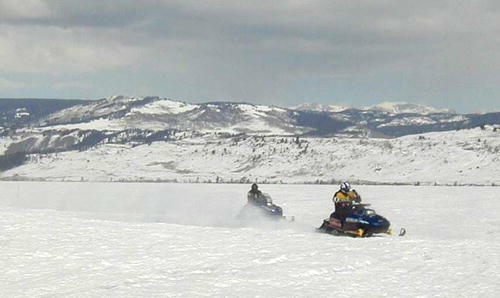 The Pinedale Snow Explorers host the Pinedale 100 Snowmobile Race each year on the frozen surface of 11 mile long Fremont Lake a few miles northeast of Pinedale. 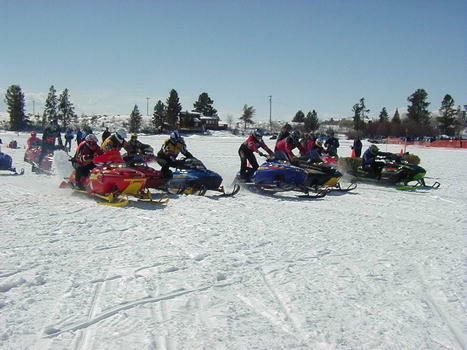 The event includes divisions for Juniors, Ladies, Veterans, a "Dash for Cash" and the main Pinedale 100 event. 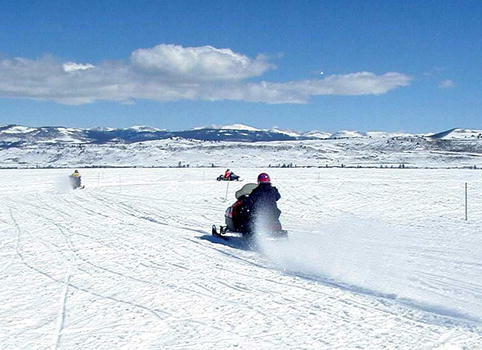 Local snowmobile businesses, including Bucky's Outdoors, Performance Tech, and Big J's Rentals help coordinate the event with the Pinedale Snow Explorers Snowmobile Club. 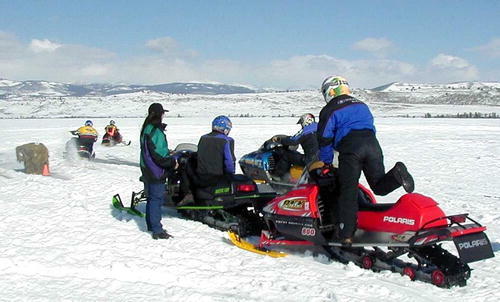 The event has grown over the last 3 years, and participating 3-person teams come from all around western Wyoming. 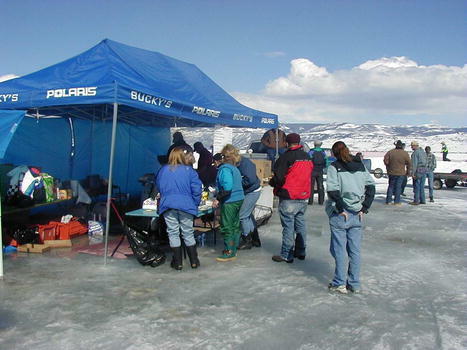 The 2001 Pinedale 100 was held on a beautiful, sunny Saturday on March 10th. 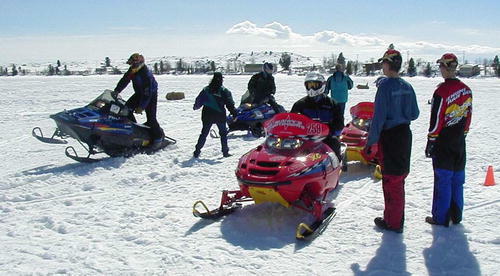 Participants included teams from Big J's Rentals, Performance Tech, Bucky's Outdoors, Afton Robinson Motors, Jackson, Bondurant, Daniel, LaBarge and Pinedale. 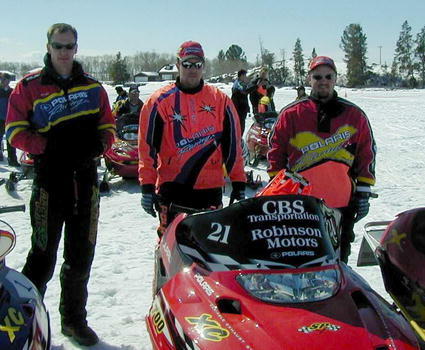 The 1st Place Winner in the Pinedale 100 was Afton's Robinson Motors team: Brothers Kevin & Jeff Kilroy and Brock Brown. 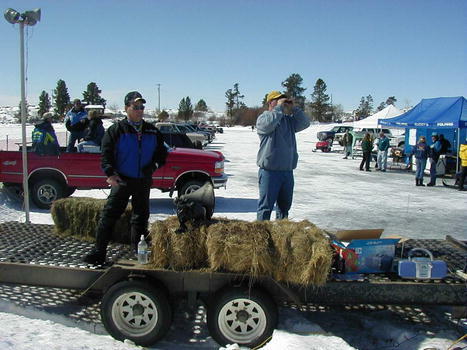 Kevin Kilroy won the $120 prize for the "Dash for Cash". 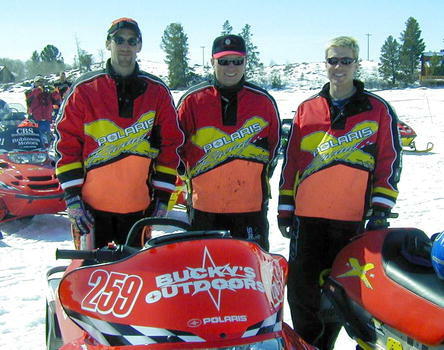 Bucky's Outdoors Pro Team placed 2nd in the 100. 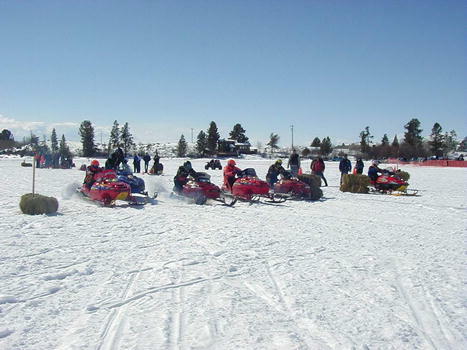 The course was actually a 12-mile lap each lap taking from 7 to 10 minutes. 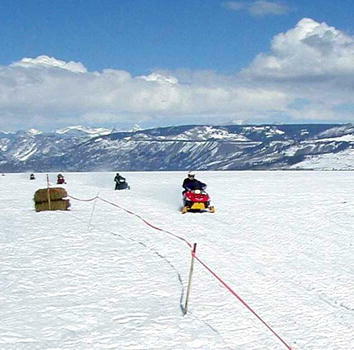 Race speeds reached from 90 to 116 miles an hour on the straight-away across the lake, and slowed in the campground segment. 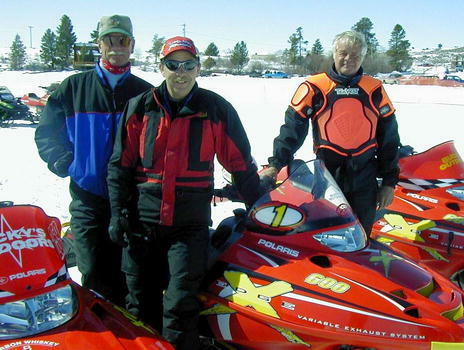 Teams were made up of three drivers and three sleds, with one of the three sleds required to be either a stock 600 or stock 700 machine with 136 inch track. 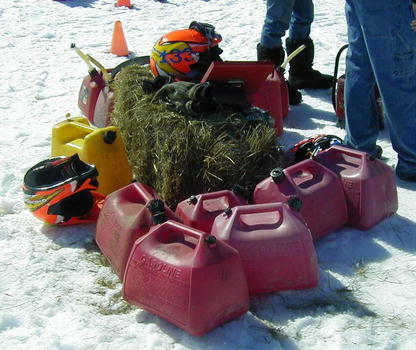 Tethers and full face helmets were mandatory, and chest protectors were advised during the race. 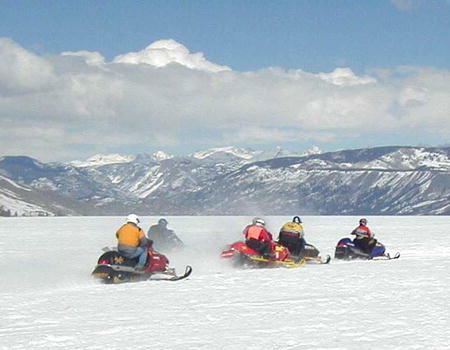 Several sleds had to be towed back to the starting area due to engine malfunctions or external damage and one sled caught fire during refueling, but for the most part the race went on without any serious injuries to sleds or racers. 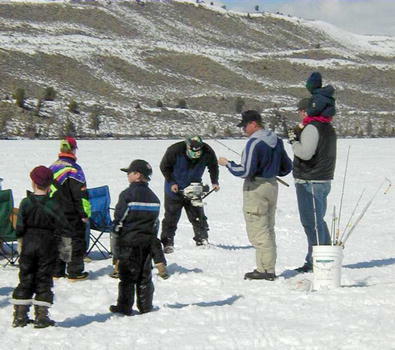 The course began on the lower end of Fremont Lake and wound over to the middle Forest Service Fremont Lake campground (near the summer homes), where it left the lake and followed the road through the campground. 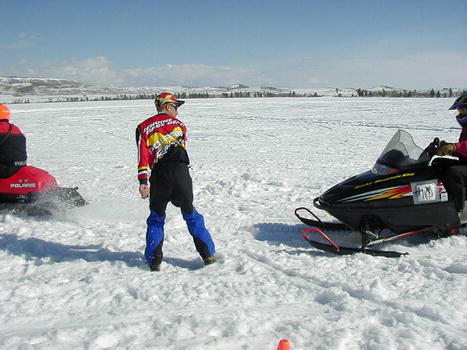 After winding through the campground roads, the course returned to the lake via the boat ramp, then looped back around to a long straight stretch to the finish line where they started. The course got a bit more rough as the day progressed, and sections of the track in the campground area were down to pavement by the time the main race was held, slowing racers down in that area as they dodged rocks and trees. 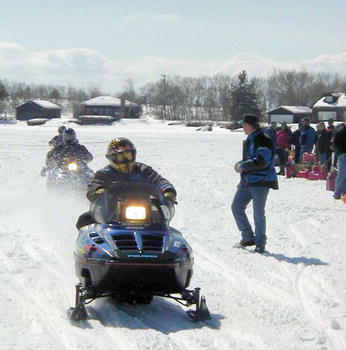 Once racers were back on the lake, drivers were able to let loose and could shuffle for position as they sped across the lake. 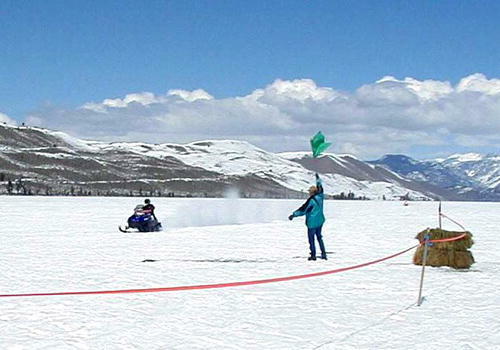 All three members of a team had to cross the fiish line before the last member of the next team crossed in order to win. 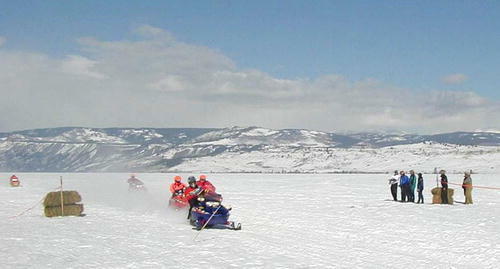 Three teams participated in the Ladies/Junior division and six teams competed in the longer, 10-lap, Pinedale 100 race. 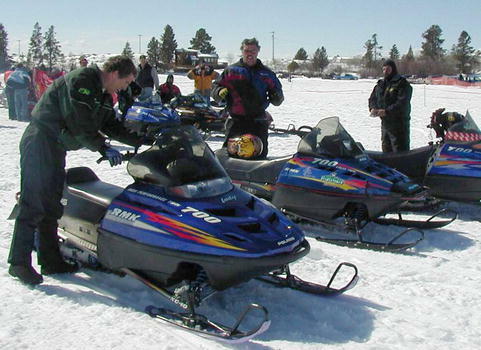 The Veteran's race was hard fought, with both Pinedale teams anxious to prove who was the best. 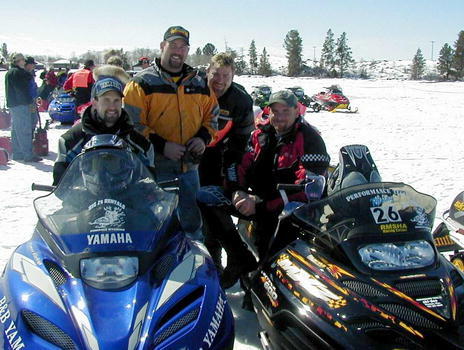 Ultimately, Gil & Brad Winters and Sander Busselle beat out the Bucky's Outdoors Vets: Jim McLellen, Harvy Norris and Gary Neely. 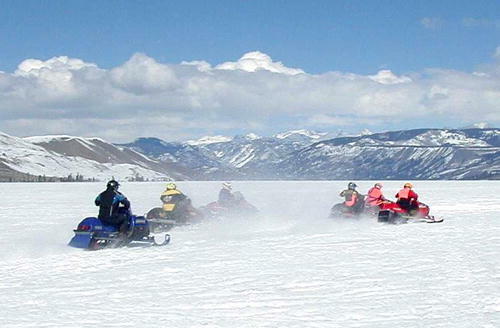 All members of the 1st and 2nd place winning teams of the Pinedale 100 were riding Polaris sleds. 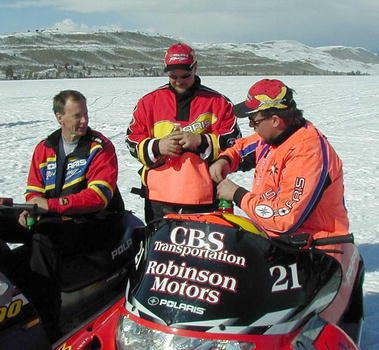 Might as well fish while we're watching the races! 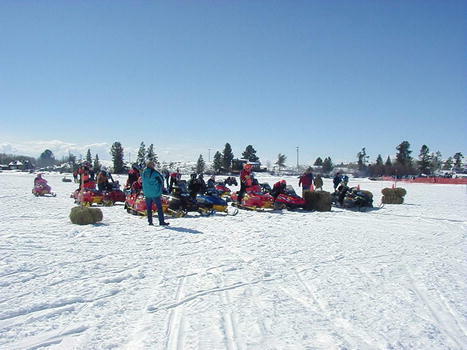 Photos by Pinedale Online, unless otherwise credited. 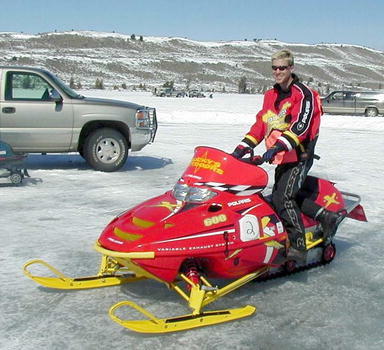 Copyright 2001, all rights reserved. May not be reproduced or used without permission.